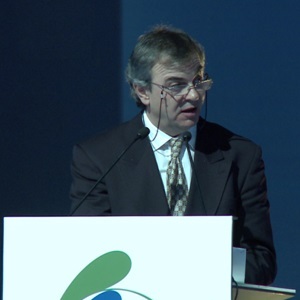 Dr. Polycarpos Falaras (National Center for Scientific Research “Demokritos”, Athens, Greece and coordinator of the European Union’s CLEANWATER Project). The prize is awarded to Dr. Falaras for his development of a novel water detoxification technology by taking advantage of solar light and advanced titania photocatalysts combined with ceramic and composite membranes. This is an innovative and efficient water detoxification technology exploiting solar energy and nano-engineered titania photocatalysts in combination with nanofiltration membranes for the destruction of extremely hazardous toxins and pollutants in natural waters and water supplies. Conventional membrane technologies to remove pathogens and toxins from drinking water rely exclusively on the physical separation (i.e., ‘‘sieving’’) of pathogenic microorganisms and other contaminants. In particular, the concentrate stream, which can be a significant percentage of the volume of treated water, will contain active pathogenic microorganisms. This waste stream can impose a serious threat to the receiving stream or site of discharge if not further treated. The new technology, by contrast, by focusing on advanced oxidation processes with global environmental applications, brings about the photocatalytic degradation of contaminants during the filtration process and permits efficient water purification. Moreover, it does so under normal solar light conditions, a key factor for the reduction of energy requirements for water treatment. Falaras’ work also emphasizes the use of novel, environmentally friendly materials and represents a cost-effective cutting-edge application of nanotechnology for enhancing water quality. 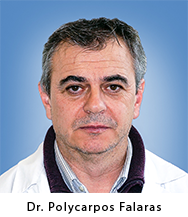 Dr Polycarpos Falaras is Research Director at the Institute of Advanced Materials, Physicochemical Processes, Nanotechnology and Microsystems, National Center for Scientific Research “Demokritos”, Athens, Greece. He is also the coordinator of the European Union’s CLEANWATER Project. • Ph.D. 1986; University Pierre et Marie Curie, Paris, France, Chemistry. • DEA 1983; Univ. Pierre et Marie Curie, Paris, France, Electrochemistry. • Diploma 1982; University of Thessaloniki, Greece, Physics. 2013: Elsevier, TOP cited paper (110)a for 2010 and 2011. 2012: International Union of Pure and Applied Chemistry (IUPAC) Award. 1999: Research Activity Award, Empeirikeion Foundation. Let me first express my deep respect and high esteem to the Authorities and the Nation of Saudi Arabia. I accept the current Award with great honor and I am very grateful to the Prize Council for this exceptional distinction, recognizing years of hard scientific work, sometimes performed under very difficult conditions. Behind such a prestigious prize there is a big idea and behind a big idea is always a great personality. This is the case of the founder of the prize, His Royal Highness Prince Sultan Bin Abdulaziz, a real environmental activist. In fact, the aim of the prize is a big one: The prize, recognizing scientific efforts and awarding research innovation in the field of water, inspires scientists for further developments and sensitizes people to water related issues. In addition, the Council’s recent decision to encourage innovative water research and applied science through a program of generous grants will further contribute to solving global water problems and protecting the environment. Thus, the real added value of this prize is that it recognizes excellence on behalf of our society and promotes innovation for our society. Water is life. Over half of the word population lives in regions where access to water will become a challenge to existence. In fact, besides human beings, animals, vegetation and environment are affected by hazardous pollutants of emerging concern that appear in water. These pollutants include industrial and pharmaceutical compounds, toxins, hormones (endocrine disruptors), and pathogenic microorganisms. There is a need for worldwide coordinated water research aiming at pollutants detection, assessment, and abatement. In this direction, the development of novel analytical techniques to identify/determine traces of new extremely harmful emerging contaminants in water and the implementation of innovative technologies for their elimination are of the highest priorities for the protection of the environment and the world's survival. In our methodology, in the frame of the EU “CLEAN WATER” project implementation, we followed a holistic approach going from the level of the nanomaterials synthesis to device design and manufacture, passing through process engineering and optimization. We thus developed an innovative and efficient water detoxification nanotechnology for the destruction of extremely hazardous toxins and emerging pollutants in natural waters and water supplies, by taking advantage of solar light and environmentally friendly, innovative titania photocatalysts combined with ceramic and composite membranes. The new technology, by contrast to conventional separation methods, focuses on advanced oxidation processes with global environmental applications and brings about the photocatalytic degradation of contaminants during the filtration process. It thus permits water purification and water quality enhancement under normal solar light conditions, with high efficiency and low cost. In the case of water resources, the obtained results are of high quality and demonstrated research excellence, confirmed by numerous papers published in pertinent journals, many Ph.D.’s successfully completed, a plethora of educational activities done and many patents acquired. These very promising research results can be used creatively and innovatively to optimize processes and develop products with relevance for our society. I invite people, fully committed to protect the environment and water resources, from Saudi Arabia and other countries to join us in a collaborative international endeavor to practically implement the newly developed technology, for the improvement of the citizens’ life and the economic development. Thank you very much! 1. V. Likodimos, D.D. Dionysiou, P. Falaras. "CLEAN WATER: Water detoxification using innovative photocatalysts”, Reviews in Environmental Science and Bio-Technology: 9 (2010) 87-94. 2. S.K. Papageorgiou, F.K. Katsaros, E.P. Favvas, G. Em. Romanos, C.P. Athanasekou, K.G. Beltsios, O.I. Tzialla, P. Falaras.“Alginate fibers as photocatalyst immobilizing agents applied in hybrid photocatalytic/ultrafiltration water treatment processes”,Water Research, 46 (2012) 1858-1872. 3. Miguel Pelaez, Nicholas Nolan, Suresh C. Pillai, Michael Seery, Polycarpos Falaras, Athanassios G. Kontos, Patrick S.M. Dunlop, J. Anthony Byrne, Kevin O’shea, Mohammad H. Entezari and Dionysios D. Dionysiou. “A review on the visible light active titanium dioxide photocatalysts for environmental applications”, Applied Catalysis B: Environmental, 125 (2012) 331–349. 4. Changseok Han, Amos Doepke, Wondong Cho, Vlassis Likodimos, Armah A. de la Cruz, Tyson Back, William R. Heineman, H. Brian Halsall, Vesselin N. Shanov, Mark J. Schulz, Polycarpos Falaras, and Dionysios D. Dionysiou. “Multi-Walled Carbon Nanotube-based Biosensor for Monitoring Microcystin-LR in Sources of Drinking Water Supplies”, Advanced Functional Materials, 23 (2013) 1807-1816. 5. P. Falaras, G. Romanos, P. Aloupogiannis. Patent: “Photocatalytic purification device”, EP2409954, published on 25/01/2012.